Small Singapore Show was presented in Manila, The Philippines in 2013. Ten members of The Artists Village presented works, which consisted of various mediums that contemplate the notion of 'smallness' within the context of nation, artworks, and space. They reflect Singapore as a tiny nation that faces space constrain and also highlighting the need to utilise minimal resources while dealing with the difficulties of exhibiting away from the homeland. Small Singapore Show 2.0: TaiSing Conversation pairs up artists from Taiwan and Singapore. They interact with one another via virtual communication platforms with the intention to explore into the subject of 'conversations' and how it could served as a means for discovery, learning and connection. By tapping on the artists' practice and concerns, it becomes a catalyst for starting an conversation. After months of exchanging views on various issues, the artists created works as a response to the conversation they've had with one another. This project aims to generate an informal albeit critical discussion via virtual conversation, which enables Taiwanese artists to deeper understand the social conditions and cultures from Singaporean artists, and to look at the gaps between imagination and reality. At the same time, Singaporeans will also be re-looking at Singapore through the lens of a Taiwanese artists. Being in a relatively small exhibition venue highlights the key initial concept of the project – exhibiting small works in a small space, and set the artists challenges in the process of making their works while dwelling on the jargon of 'small'. 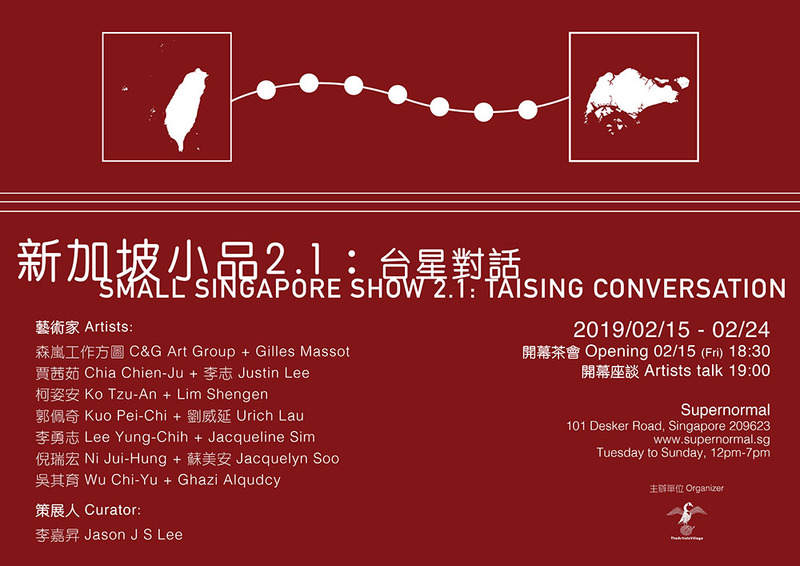 Small Singapore Show 2.1: TaiSing Conversation is an extended phase of version 2.0 exhibition which was held in Taipei City during October 2018. By presenting the exhibition in Singapore, we hope to connect the Taiwanese artists with the audiences in Singapore while exchanging views and sharing possible experiences of Singapore and Taiwan.